Crafts are an important art form in Burundi and are attractive gifts to many tourists. Basket weaving is a popular craft for Burundian artisans. Other crafts such as masks, shields, jewelry, painting, wood curving; metal work statues and pottery are made in Burundi. A visitor has many art and crafts centers to choose in the Bujumbura city center as well as in many of the rural communities where the use of locally made handcrafts is more for basic necessity than for commercial reasons. Crafts are as well an essential part of the Burundian cultural heritage. Amongst the traditional handicrafts, tightly woven baskets (with lids) are very special. From the twa, there are pottery of all size with some decorated, others not. In addition they produced masks, shields and wooden statues. Figurative art form is very commonly practiced in Burundi art. The European and Italian imprints is seen in the Burundi works of art like in mosaics. The themes of the designs mainly concentrate on Burundi life but the marks of the western art are also evident. 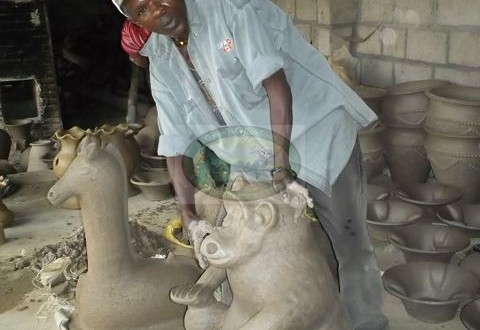 There are many artisan centers in Burundi like Le Musee vivant and Le Musee national. Both of these art centers in Burundi mainly deals with modern art. A wide range of variety is found in Burundi art. Geometrical figures and various types of designs with beautiful colors and shapes are predominant in Burundi art. Decorative motifs are a very common in the art of Burundi. The Burundi art is visible in pottery, sculpture, bas-relief and wickerwork. The children of Burundi are also engaged in various types of art work. They love wall paintings in which village sceneries and many other beautiful themes are given expression. With regards to dance, each region, in addition to main dances, has a specific kind of dance and drum. Initially drums were played for royal or religious ceremonies, sacred rituals, and for specific stages of life but more and more drumming has become a form of entertainment. The Batimbo dancers are very acrobatic and repeat gestures of daily life. Thanks to that rare performance, the Batimbo became famous and while it kept a sacred character in the area of origin, the performance spread to the whole country but with a more cultural rather than sacred character because the ritual did not really exist outside the Gitega province. Experience Burundi with Green Hills Ecotours local guides will give you the great opportunity to explore the scenic beauty, history, diverse culture and enjoy the local food while interacting with local people. We are deeply committed to ensuring that your vacation dreams become a reality and Travel with Green Hills Ecotours for your Burundi safaris holidays & adventures while giving our contribution to conservation and improving the well-being of local people. All of our tours are private & can be customized to your style, schedule & budget.